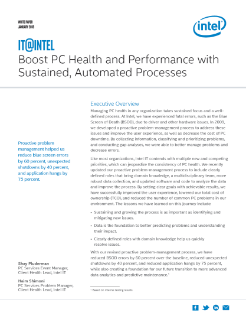 Managing PC health in any organization takes sustained focus and a well-defined process. At Intel, we have experienced fatal errors, such as the Blue Screen of Death (BSOD), due to driver and other hardware issues. In 2009, we developed a proactive problem-management process to address these issues and improve the user experience, as well as decrease the cost of PC downtime. By collecting ...information, classifying and prioritizing problems, and conducting gap analyses, we were able to better manage problems and decrease errors. • Sustaining and growing the process is as important as identifying and mitigating new issues. • Data is the foundation to better predicting problems and understanding their impact. • Clearly defined roles with domain knowledge help us quickly resolve issues. With our revised proactive problem-management process, we have reduced BSOD errors by 60 percent over the baseline, reduced unexpected shutdowns by 40 percent, and reduced application hangs by 75 percent, while also creating a foundation for our future transition to more advanced data analytics and predictive maintenance.